Cowley, Robert (ed.). What If? The World's Foremost Military Historians Imagine What Might Have Been . Putnam's 1999. Cowley, Robert (ed.). What If? Series note: Series of collected speculations by historians — What If? , What If? 2 , and What Ifs? of American History — likely launched by the article "The Road Not Taken…". The amount of speculation in each essay varies, ranging from a paragraph or two of weak speculation up to a complete faux historical article. In general, though, the emphasis is on explaining why certain events were crucial toward developing the history that did occur rather than outlining a history which didn't. Cowley, Robert (ed.). "The Road Not Taken…"
Summary: Speculations by 37 historians on various possible turning points, from Salamis (480 BCE) to NATO's Able Archer exercise (1983). However, all are very short and only a few do more than indicate why the event was historically interesting. Discussion of the article appears in W.H. Honan's "Historians Warming To Games Of 'What If'", q.v., and P.T. Reardon's "Remaking history", q.v.. Several of the essays are developed at longer length in Cowley's What If? The World's Foremost Military Historians Imagine What Might Have Been , q.v. 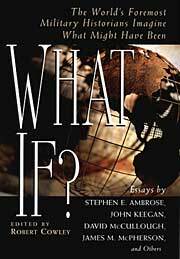 Series note: Article which launched the What If? series of collected speculations. Published: In MHQ: The Quarterly Journal of Military History Spring 1998. Published: Four of the speculations excerpted in The New York Times May 10, 1998, section 4 ("City"). 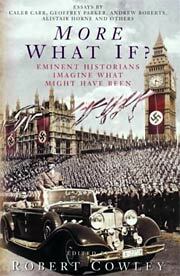 Published: Fourteen of the speculations reprinted in Cowley's What If? The World's Foremost Military Historians Imagine What Might Have Been , q.v.. Translation: Italian of fourteen of the speculations by Renzo Peru and Orietta Putignano in La storia fatta con i se , the Italian edition of What If? . Cowley, Robert (ed.). What If? . Translated to the Italian as La storia fatta con i se . Rizzoli 2001. Cowley, Robert (ed.). What If? . Translated to the German as Was wäre gewesen, wenn? , Knaur 2000. Summary: Twenty new speculative essays on military history, including, in divergence order, William H. McNeill "Infectious Alternatives: The Plague that Saved Jerusalem, 701 B.C. ", Victor Davis Hanson's "No Glory that was Greece: The Persions Win at Salamis, 480 B.C. ", Josiah Ober's "Conquest Denied: The Premature Death of Alexander the Great", Lewis H. Lapham's "Furor Teutonicus: The Teutoburg Forest, A.D. 9", Barry S. Strauss's, "The Dark Ages Made Lighter: The Consequences of Two Defeats", Cecelia Holland's "The Death that Saved Europe: The Mongols Turn Back, 1242", Theodore K. Rabb's "If Only It had Not Been Such a Wet Summer: The Critical Decade of the 1520s", Ross Hassis's "The Immolation of Hernàn Cortés: Tenochtitlan, June 30, 1521", Geoffroy Parker's "The Repulse of the English Fireships: The Spanish Armada Triumphs, August 8, 1588", Thomas Fleming's "Unlikely Victory: Thirteen Ways the Americans Could have Lost the Revolution", David McCullough's "What the Fog Wrought: The Revolution's Dunkirk, August 29, 1776", Alistair Horne's "Ruler of the World: Napoleon's Missed Opportunities", James M. McPherson's "If the Lost Order Hadn't Been Lost: Robert E. Lee Humbles the Union, 1862", Stephen W. Sears's "A Confederate Cause and Other Scenarios: How the Civil War Might have Turned Out Differently", Robert Cowley's "The What Ifs of 1914: The World War that Should Bever have Happened", John Keegan's "How Hitler Could have Won the War: The Drive for the Middle East, 1941", Theodore F. Cook's "Our Midway Disaster: Japan Springs a Trap, June 4, 1942", Stephen E. Ambrose's "D Day Fails: Atomic Alternatives in Europe", and Arthur Waldron "China Without Tears: If Chiang Kai-Shek Hadn't Gambled in 1946". Some of these are expanded from the very short essays which appeared in Cowley's "The Road Not Taken…", q.v., and fourteen others from that collection are reprinted here. Series note: First of the What If? series of collected speculations. Published: As What If? The World's Foremost Military Historians Imagine What Might Have Been , Putnam's 1999 (0399145761BUY); Berkley 2000 (0425176428BUY). Published: As What If? : Military Historians Imagine What Might Have Been , Macmillan 2000 (0333751833), Pan 2001 (0330487248). Translation: German as Was wäre gewesen, wenn? Wendepunkte der Weltgeschichte , Knaur 2000 (3426664232), 2002 (342677609X). 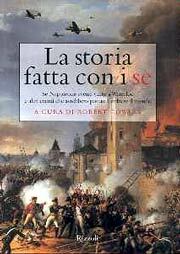 Translation: Italian by Renzo Peru and Orietta Putignano as La storia fatta con i se , Rizzoli 2001 (8817868264). Cowley, Robert (ed.). What If? 2 . Cowley, Robert (ed.). More What If? . Pan 2003. Summary: Twenty-five new speculative essays, including Victor Davis Hansen's "Socrates Dies at Delium, 424 B.C. ", Josiah Ober's "Not by a Nose", Carlos M.N. Eire's "Pontius Pilate Spares Jesus", Cecilia Holland's "Repulse at Hastings, October 14, 1066", Theodore F. Cook's "The Chinese Discovery of the New World, 15th Century", Geoffrey Parker's "Martin Luther Burns at the Stake, 1521", Theodore K. Rabb's "If Charles I had Not Left Whitehall, August 1641", Thomas Fleming's "Napoléon's Invasion of North America", Tom Wicker's "If Lincoln had Not Freed the Slaves", Alistair Horne's "France Turns the Other Cheek, July 1870", John Lukacs's "The Election of Theodore Roosevelt, 1912", Robert L. O'Connell's "The Great War Torpedoed", George Feifer's "No Finland Station", Geoffrey C. Ward's "The Luck of Franklin D. Roosevelt", Williamson Murray's "The War of 1938", Andrew Roberts' "Prime Minister Halifax", James Bradley's "The Boys Who Saved Australia, 1942", David Kahn's "Enigma Uncracked", Robert Katz's "Pius XII Protests the Holocaust", Caleb Carr's "VE Day — November 11, 1944", Roger Spiller's "The Führer in the Dock", Richard B. Frank's "No Bomb: No End", James Chace's "The Presidency of Henry Wallace", Lance Morrow's "A Tale of Three Congressmen, 1948", and William H. McNeill's "What If Pizarro had Not Found Potatoes in Peru?". 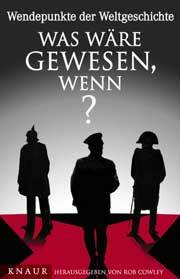 Unlike the first What If book, this volume includes a number of speculations not based on military events. 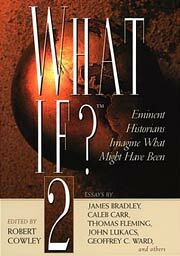 Series note: Second of the What If? series of collected speculations. Published: As What If? 2 , Putnam's 2001 (0399147950BUY), Berkley 2002 (042518613XBUY). Published: As More What If? , Pan/Macmillan 2002 (0333905105), 2003 (0330487256). Translation: Portuguese as E Se…? Como Seria a História Se os Fatos Fossem Outros , Campus 2003 (8535212396). Cowley, Robert (ed.). What Ifs? of American History . Putnam's 2003. Cowley, Robert (ed.). What If? America . Pan/Macmillan 2004. Summary: Seventeen speculative essays (fifteen new and two reprinted) including Theodore K. Rabb's "Might the Mayflower Not Have Sailed? ", Caleb Carr's, "William Pitt the Elder and the Avoidance of the American Revolution", David McCullough's "What the Fog Wrought: The Revolution's Dunkirk, August 29, 1776", Tom Wicker's "'His Accidency' John Tyler", Victor Davis Hanson's "Lew Wallace and the Ghosts of the Shunpike", James M. McPherson's "If the Lost Order Hadn't Been Lost: Robert E. Lee Humbles the Union, 1862", Thomas Fleming's "The Northwest Conspiracy", Jay Winik's "Beyond the Wildest Dreams of John Wilkes Booth". Cecelia Holland's "The Revolution of 1877", Andrew Roberts's "The Whale Against the Wolf: The Anglo-American War of 1896", John Lukacs's "No Pearl Harbor? : FDR Delays the War", Antony Beevor's "If Eisenhower Had Gone to Berlin", Ted Morgan's "Joe McCarthy's Secret Life", George Feifer's "If the U-2 Hadn't Flown", Robert L. O'Connell's "The Cuban Missile Crisis: Second Holocaust", Robert Dallek's "JFK Lives", and Lawrence Malkin and John Stacks' "What if Watergate Was Still Just an Upscale Address?". Series note: Third of the What If? series of collected speculations. 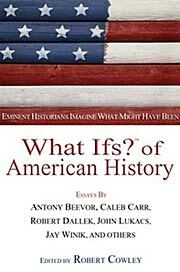 Published: As What Ifs? 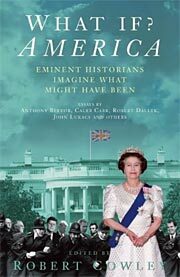 of American History , Putnam's 2003 (0399150919BUY). Published: As What If? America , Pan/Macmillan 2004 (1405041692). Series note: Am omnibus volume including Cowley's What If? and What If? 2 .